Preheat oven to 350° F. Spray a 12-cup mini muffin tin with nonstick baking spray. In a small food processor, pulse granola until finely crumbled. Stir in butter and sugar. Spoon mixture into prepared mini muffin tin, pressing the center down with your finger to create an indentation in the center. Bake for 6-8 minutes, or until the edges begin to turn slightly golden. Remove from oven and cool completely before gently transferring granola cups to serving tray. 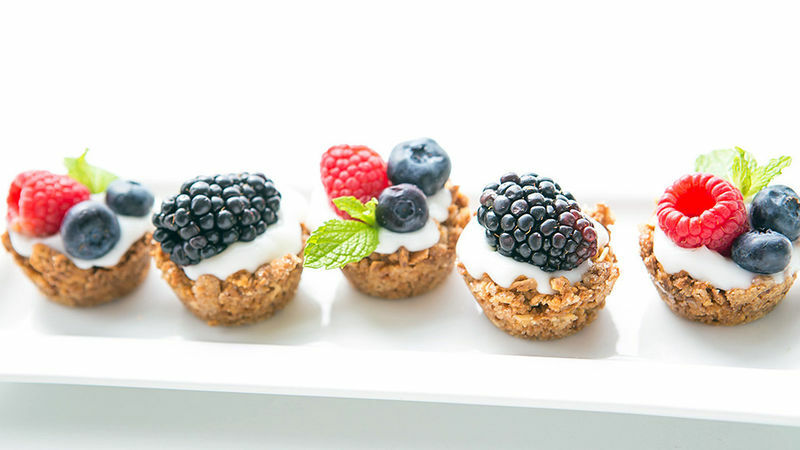 To serve, place a dollop of vanilla yogurt in the center of each granola cup. Top with fresh berries. Serve immediately and enjoy!